In 1877, Thomas Edison invented the phonograph. By 1895, a shellac-based disc was introduced and became standard. Too fragile, these 10 inches Shellac records played at a speed of 78 revolutions per minute. The mechanical surface noise of the contact of the needle with the disk groove was very intense, resulting in a loss signal-noise ratio. The disc 10 inches diameter rotating at a speed of 78 rpm resulted in about only 3:30 minutes of performance. Thus the time of recording became a great problem, creating difficulties to perform a more elaborate song, mainly when playing Erudite / Classical music with its many and long movements. Complete Collection 75 records! 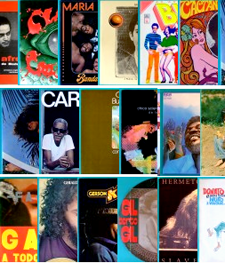 The most complete reference of Brazilian Music! Many albums are still sealed! Upgraded Edition! 8-recod set with booklet on a box! A Great sample of Brazilian Popular Music!